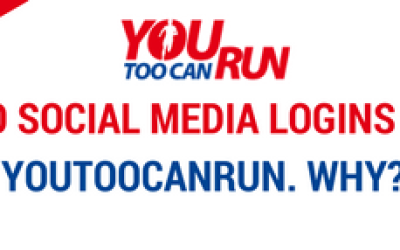 Jayanti Poojari joined the team at YouTooCanRun. Though she was having an atheltic background before, she had never run. She aspired to run the Pinkathon 10K and with about 7 weeks of training she ran the distance at a comfortable speed. Read all about her adventure here. Background : During my childhood I used to play gully cricket. Later on in college participated in box cricket and our team won in all consecutive three years. I have always been interested in sports and adventure. My favourite sport is cricket, badminton, table tennis and so on… Having been a member of NSS during college, my need for outdoor adventure was fulfilled. Also did a short 2 months course in Kick Boxing. So I have always been physically fit. College over, all the adventure and sports activity came to a halt. It was restricted to indoor games in the de-stress room when I worked in a BPO. Playing TT, treasure hunt, box cricket was a weekly affair. 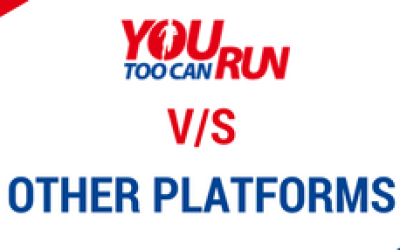 November 2013, I joined “YouTooCanRun” and our mission is to “Promote Running for Good Health” Our Chief Running Evangalist, an avid runner himself, Mr P Venkatraman, motivated me to run. Being a well accomplished and well read runner himself, he took the initiative to train us to run. 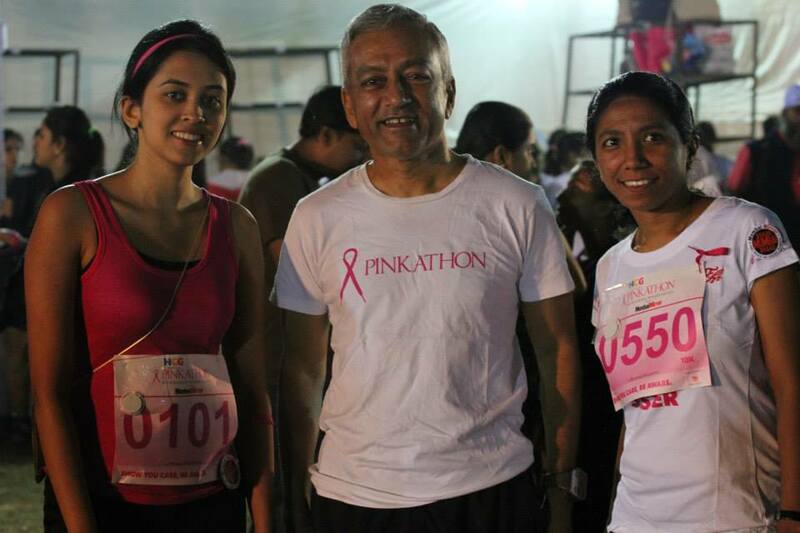 As an immediate goal he encouraged us to run for the Pinkathon 2013 in Mumbai. This Blog is an consolidated report of how our training progressed. And how we could run a 10K distance with easy training. Hopefully it will encourage the reader also to take up running for their own good health. My first day of training, had to wake up at 5.30 am. All these years my waking hour has been 7.30am. Training started with a round of mild stretching. After an hour of brisk walking we ran half a round and then walk. For the first time I learnt what is the correct way to land my feet on the ground, thanks to my boss and trainer Mr Ventakraman. He also told me that at the end of the run it is important to stretch and thank God. I ran/walk for 4K. It was tiring and had cramps the next day. Today was the second session. We started with the usual round of warming up and walk / ran for 5K. I intend to continue with my running practice at least three times a week.Today also there was emphasis on gait and posture while running. I surely want to participate in the “Pinkathon” for 5K. 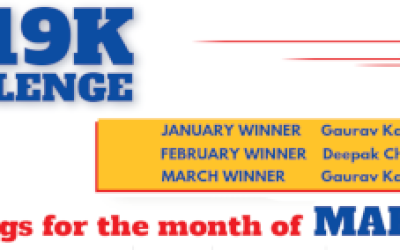 Have less than a month for training, but who knows with my interest in sports being renewed, I may just end up participating for 10K. Started with warm up exercise. Today we pushed ourselves and ran/walk for 6K. This time there was more of running and less of walking. There was a sense of achievement for running/walking 6K. Never dreamt that I will run/walk 6K. There was sudden rise in confidence that I can go beyond 6K. Lesson learnt today not to eat outside food. Also your body can sustain without drinking water if you have run for 1.5hours. This time it was a different experience, since sir was not there with us. I and my training partner and team member Poorna decided to do a run on our own. We ran 6K from Kalina CST road to Asian Heart at Bandra BKC and came back. Never imagined that this distance would one day be done by foot. Woke up at 5am. This time we took a different route starting from Kalina CST road to family court at Bandra BKC. Every session the run is becoming longer which I am enjoying it. Ran a total of 7.5K. Felt good that I have crossed 6K and all thanks to Mr P Ventakraman my trainner for making it possible and building the confidence within us. Now, I am sure that 10K will not be difficult for me to run. The pleasant weather made today’s activity a little easier. Today got up at 6am and decided to run alone, since there had been a long gap in training. Started the run from Vakola Church to University road. Ran for 1hour. Today sir and I decided to run 10K, but we ran 9.5K which was the most difficult of all the days. Legs were hurting a lot, but nothing was going to stop me from completing the run. In the Middle of the run I felt a little breathless, then walked for few meters to gather my breath. Sir kept me motivated throughout the run. I was happy with my run. This was my longest run from the day we started the training. Only few days left for Pinkathon and now I am sure I will complete the race with full confidence. 14th Dec 2013 day before the main event went to collect the BIB Number from Phoenix Mall, Lower Parel. Right opposite PVR Cinema 4 stalls were set up. After showing the invoice the lady at the counter punched in my name and handed me the BIB Number along with the Little Pink Bag. So 0505 it was – my BIB Number for the race. After reaching home, checked the pink bag. It had a t-shirt, a band, a key chain, a discount health care voucher and a pink lace tag. As instructed by my mentor, I rested my legs and watched television. Before going to bed socked my feet in warm water to which spa salt was added. After a light dinner at 9.30 pm, I went to bed. Woke up 4.30 am. A quick bath followed by a light breakfast, I stepped out with excitement. My mentor picked us up and took us to the venue – BKC ground. On reaching at 5.45 we were witness to a huge crowd gathered. The stage was set up. The participants were warming up, the families and friends gathered were busy clicking pictures. We, the participants, were asked to come closer to the stage. Shaimak Davar’s troupe danced to a Bollywood number and also showed us a few warm exercises. 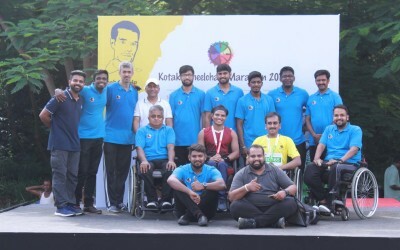 Milind Soman and Gul Panag spoke words of encouragement. We were all set. I along with the other 10K participants aligned at the start line. After a whistle the race was flagged off. I started off with a short walk and then started sprinting. After about 2 kms of run, took a water break and started running. My plan was to run using streetlight poles as reference markers. We were to run for 5 pole distance followed by a walk to 2 pole distance. This was continuedthroughout the race. Our mentor, Mr Venkatraman, caught up with us in different parts of the loop and kept encouraging us and also clicking pictures. I also chatted with fellow contestants along the way. Reached the end point at 7.35 am. I had no clue in how much time I had covered the distance. Refreshments were provided followed by the closing ceremony. Once I reached home, got a SMS message saying “ Congratulations! You have finished your 10K run in 01:19”. I was very happy with my performance. Next Pinkathon I am surely going to better this timing. How about 10K in 60 mins!!! With a year to practice, who knows I can surely achieve this. A Big Thank You to my mentor Mr Venkatraman for all his support, training and encouragement. Jayanti is more fit than Poorna due to her past athletic background. Both are young and have lean body mass. Thus I could increase the training load very fast and take them to their first 10K run in a rather short span. Being their first 10K run and also first running event participation, I know that the energy would take her through. Her plan for the race was to have frequent walk breaks. She did well without any incident at all. 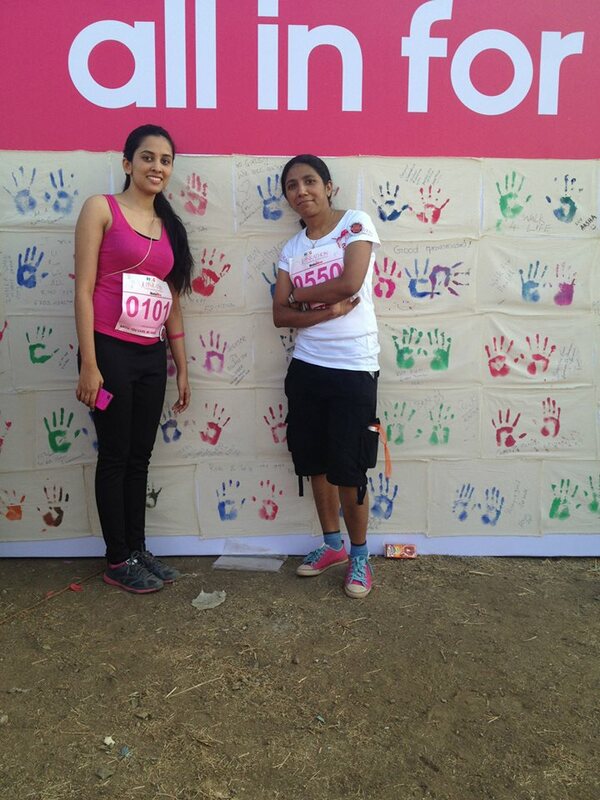 Few images from Pinkathon !! !